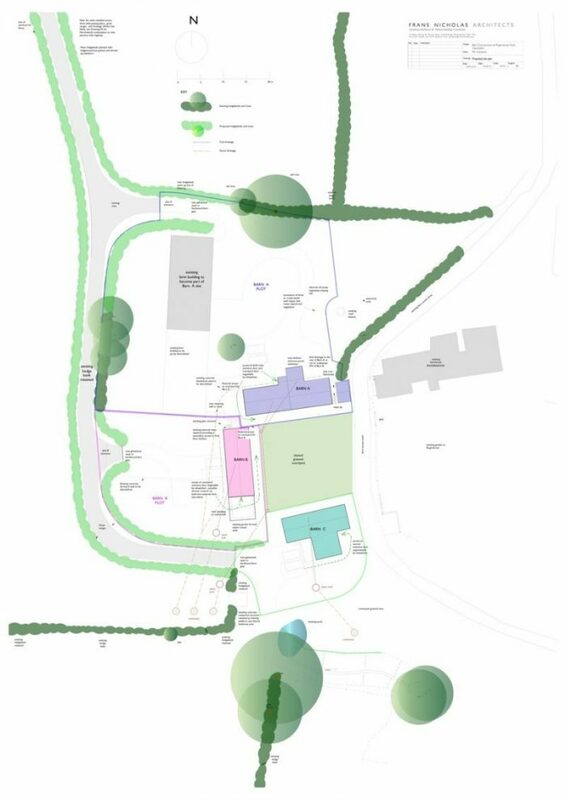 Site plan from a successful planning application for the conversion of 3 stone barns in a farmyard. 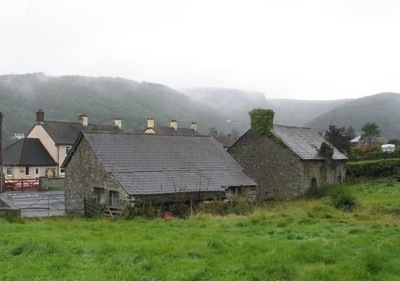 This involved the re-planning of the farm, with a new access, and detailed provision for bat and wildlife conservation. The practice successfully won planning consent for our client for the conversion of this early C19 smithy, comprised of two stone buildings straddling a stream. A complex flood risk assessment was needed, followed by the inclusion of a number of flood protection measures. 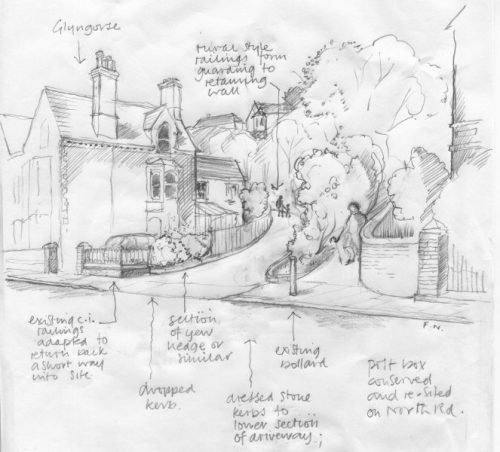 An ad hoc gap in the fabric of a Conservation Area, which our clients proposed could be used for access for their development of land to the rear. We were able to demonstrate that a well-designed access could indeed be inserted here. 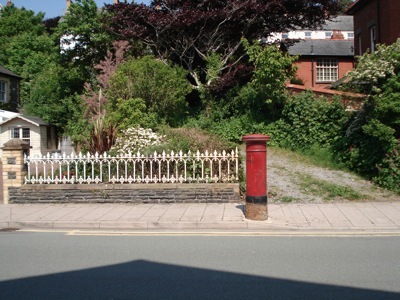 A sketched proposal for a new access in the gap shown in previous slide, forming a viable entrance to a the proposed new development. We were able to reassure the Planning Inspector that a sensitive design was needed, and could be achieved. In common with most architectural practices, we are sometimes asked to make planning applications separately from a commission to proceed with the detailed design or to become involved with its construction. While we always prefer to be involved in the whole life of a project, we do understand that there is sometimes a need to progress aspects of a project at different times. In order to do this, we would normally want to satisfy ourselves that a sound scheme is possible, and that it could have a good environmental outcome. Our experience is that, with imagination and good design, very few sites are so intractable that nothing positive can be made of them. Our experience and training in conservation work usually allows us to make a decisive and successful intervention with regard to planning consents for existing buildings and environments, whether listed or not. However, we are also happy to obtain planning for new build schemes on both greenfield and brownfield sites. Frans Nicholas has had many years of experience designing housing and commercial/ industrial developments, both since the founding of this practice, and before, when, he worked at different times in his career in private practice, the civil service, local government, and the housing association sector. DIFFICULT SITES: we have obtained planning consent on several sites that presented particular difficulties, including developing or converting buildings in flood risk areas, in or near Conservation Areas, on sites with archaeology, and sites with complex environment issues including woodland and sensitive ecosystems. We have also worked on sites formed of made ground; with mining subsidence; on contaminated ground; and sites in exposed maritime environments. We have successfully obtained planning consents for residential development on exceptionally narrow urban sites. We maintain links with practitioners in other disciplines with whom we have had a good working relationship in the past, whom we can bring in on a particular project if needed e.g. highways engineers, ecologists, tree experts, archaeologists, soil engineers, energy consultants.